The Purple Pitcher plant is native to the eastern U.S. as well as the Great Lakes region and eastern Canada. It is the only species of Sarracenia that thrives in a cold, temperate climate. The species is made up of two sub-species, S.purpurea-purpurea and S. purpurea-venosa. S.p.purpurea the more cold hardy and requires a dormant period. S.p.venosa thrives in warmer climates. The pitchers of S. purpurea are semi-recumbent, lying horizontally on the ground. Like other members of the Sarracenia the pitchers trap insects and other invertebrates in a pool of water that contains both enzymes and a community of bacteria that help digest the prey. 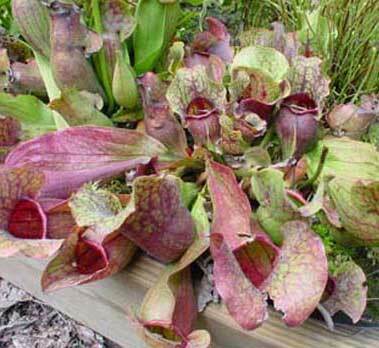 S. purpurea grows in nutrient poor bogs and obtains it’s nutrients from the prey it digest. The flowers are beautiful crimson color.